We are committed to supporting, protecting, and promoting the value of integrating the Bible--divinely inspired, true, and authoritative--throughout all curricular and co-curricular aspects of the educational experience on our campuses, including teaching and research. We support a coherent approach to education in which the development of the mind, spirit, body, and emotions are seamlessly woven together in the quest not just for knowledge but also for wisdom. Through an array of initiatives, we promote the development of high-quality academic research projects, provide opportunities for faculty to conduct innovative research with peers from other campuses, and provide administrators with opportunities to gain the most current information in order to lead highly successful campuses that employ best practices for student thriving and academic success. Public Advocacy | As an effective and respected advocate for Christ-centered higher education both in the U.S. and around the world, we provide a unified voice to highlight the contributions of our institutions to the common good. 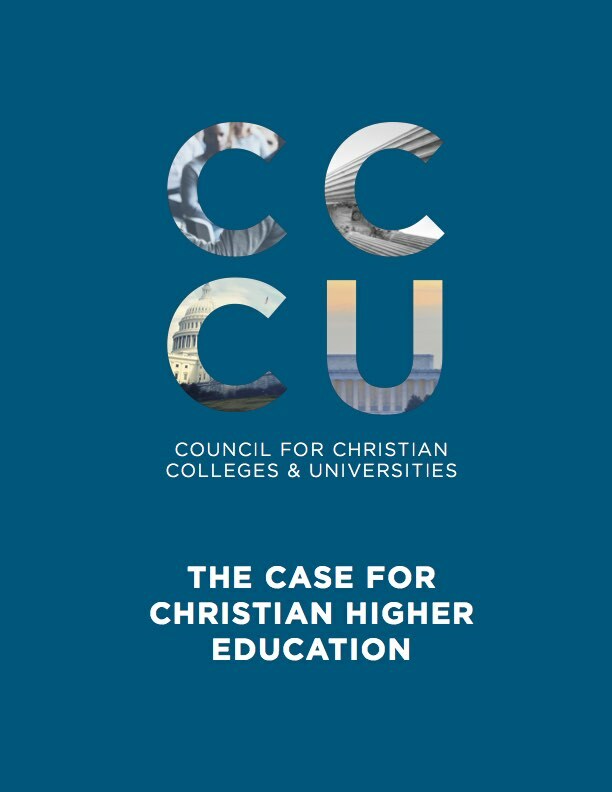 We also advocate for the right of each CCCU institution to practice its sincerely held religious beliefs and to participate fully in the public square without penalty. Professional Development & Scholarship | We host numerous conferences for administrators to develop their skills, build connections with peer leaders, and equip them in their work to provide a holistic Christ-centered educational experience for their students. We also invest in faculty development and scholarship through institutes and grants intended to help faculty excel in their scholarship and integrate faith into their discipline. Our leadership institutes also play a pivotal role in ensuring that the pipeline of leaders in Christian higher education is filled with a diverse pool of highly qualified candidates. Experiential Education | We offer faith-integrated, off-campus study programs in nine locations across the U.S. and around the world that foster students’ intellectual, cultural, vocational, and spiritual growth. These programs extend the educational mission of CCCU institutions by providing culturally immersive learning experiences that equip students to apply their Christian faith to the world. According to the U.S. Department of Education, there are more than 4,700 degree-granting institutions of higher education in the United States. 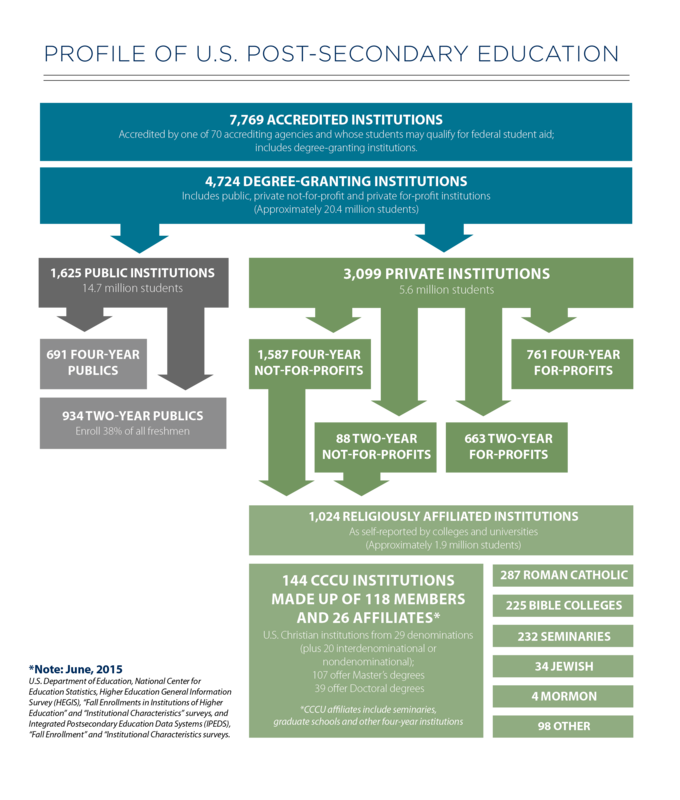 These include nearly 3,100 private institutions, just over 1,000 of which define themselves as religiously affiliated. Of those, 140 have found common cause in the mission of the CCCU. 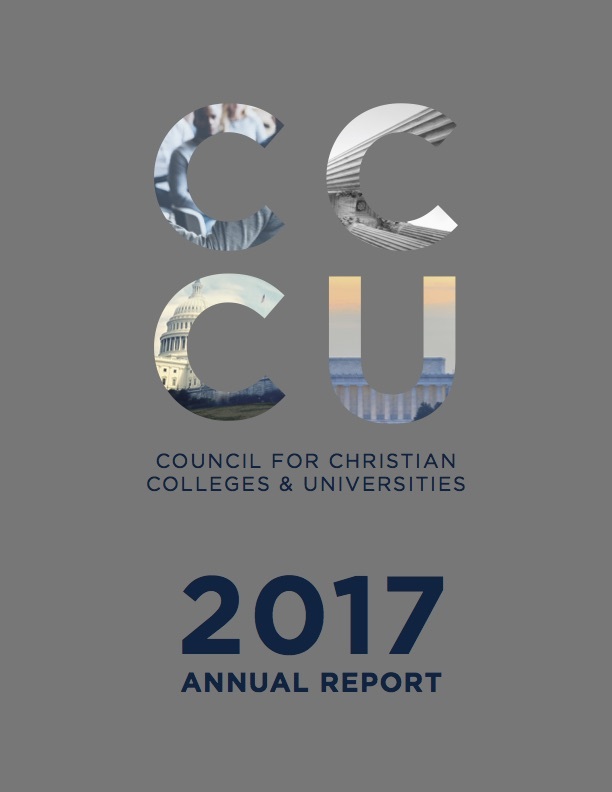 The CCCU was founded more than 40 years ago with a purpose that was simple to state but lofty in ideal: Create a broad association of Christian colleges that would support promotion and leadership activities for member schools and provide a unifying voice for Christian higher education in the public square. At the same time, the Council’s founders launched the organization’s first faith-integrated, semester-long experiential study program: the American Studies Program in Washington, D.C. ASP’s launch laid a foundation for future transformative and immersive global off-campus programs, now known as BestSemester, which have educated and transformed the lives of more than 13,000 students through experiential education rooted in Scripture and the belief that faith can be integrated into all aspects of life in all locations around the world. Since the CCCU and BestSemester were founded in 1976, we may have changed in size, in scope, in office location, and even in name, but we have always remained rooted in our mission: to advance the cause of Christ-centered higher education and to our help our institutions transform the lives of students by faithfully relating scholarship and service to biblical truth. First, we integrate biblical truth not just into “spiritual” aspects of the institution but throughout the academic enterprise. Our professors pursue academic excellence because they are committed to God as the author of truth, and that truth has implications for every academic discipline. The classroom and the laboratory are just as much arenas of Christian integration as the college chapel. Second, we are committed to the moral and spiritual formation of students. Education that instructs the mind without deepening the soul is not true learning. Our schools seek to develop students who, in the words of the Old Testament prophet, “act justly and love mercy and walk humbly with their God” (Micah 6:8). This requires not simply professional competence but wisdom, which is a sense of things in their proper relationship and a love for the right things. Our purpose is to form students of moral commitment who live out Christian virtues such as love, courage, and humility. This task gives meaning and coherence to every part of the academy, from the classroom to the fine arts studio, from the internship placement to the residence hall and the athletic field. Third, we are committed to graduating students who make a difference for the common good as redemptive voices in the world. Our schools offer a wide variety of academic programs because we believe that Christians are called to use their vocations as vehicles to bring the good news of Jesus Christ to a fallen world. Our graduates are “hopeful realists” who recognize the brokenness of the world but believe that God has called them to work for its healing. As such, they play a redemptive and restorative role in the world as doctors, teachers, marketers, engineers, parents, soccer coaches, and in a host of other ways. In other words, we are private religious institutions that exist for the public good and contribute to human flourishing. To fulfill our mission and meet the needs of our institutions, we provide unique services for administration, faculty, students, and friends of Christian higher education. Under the leadership of President Shirley V. Hoogstra, the global team at the CCCU strives to advance faith and intellect for the common good. Our many programs and services are coordinated by a core team in Washington, D.C. and by the staff of each BestSemester program around the world. Our board of directors provides leadership and vision central to the CCCU's mission. The CCCU staff work closely with a strong group of volunteer leaders to fulfill the Council’s mission. Advisory groups, called Commissions, advise the president and staff as well as help organize many conferences and projects. From sponsoring conferences and events to utilizing print, email and website advertising opportunities, we provide a variety of ways for you to connect with key leaders on CCCU campuses. 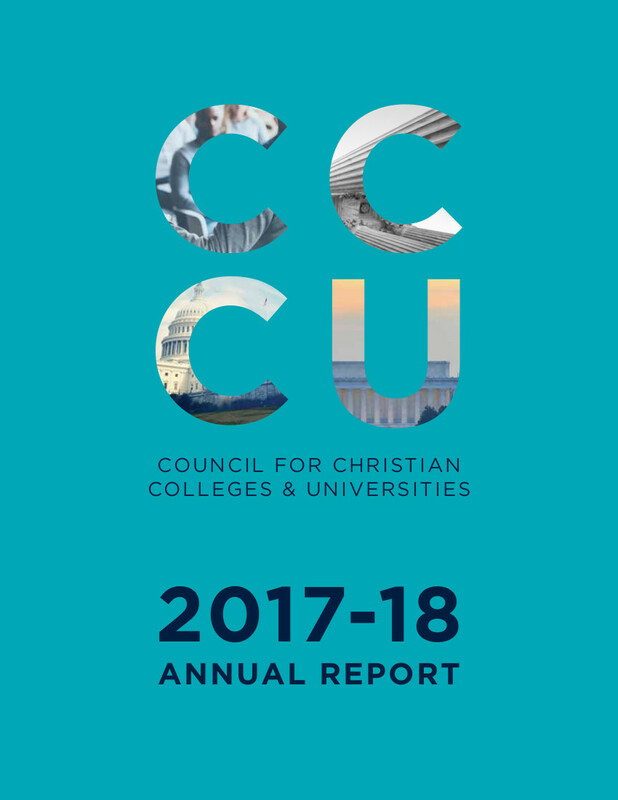 The CCCU partners with a wide variety of organizations who all hold different roles in higher education, in religious freedom, and in Christian formation. We regularly recognize individuals who have championed the cause of Christian higher education. Champion of Higher Education Award The Champion of Higher Education Award is presented to individuals who have demonstrated strategic vision and unparalleled dedication to the field of higher education. Champion of Vision Award The Champion of Vision Award is presented to individuals who have championed partnerships to promote the flourishing of CCCU institutions and their surrounding communities. John R. Dellenback Global Leadership Award The John R. Dellenback Global Leadership Award is presented to individuals who have made outstanding contributions to Christian higher education through scholarship, writing, and public influence. Mark O. Hatfield Leadership Award The Mark O. Hatfield Leadership Award is presented to individuals who have demonstrated uncommon leadership that reflects the values of Christian higher education. The award was established in 1997 in honor of Senator Hatfield, a longtime supporter of the Council. Robert and Susan Andringa Award for Advancing Racial Harmony The Robert and Susan Andringa Award for Advancing Racial Harmony celebrates the achievements of CCCU campuses in making progress in the areas of diversity, racial harmony, and reconciliation. Philanthropy Award The Philanthropy Award is presented to individuals who have made significant philanthropic contributions to the work of the Council for Christian Colleges & Universities and its membership. Young Alumni Award The Young Alumni Award is presented to individuals who have graduated within the last 10 years and have achieved uncommon leadership or success in a way that reflects the values of Christian higher education. Join us in our work to advance faith and intellect for the common good.